All IRt/c models with stainless steel housing are built with complete electrical shielding of both the housing and cable, with the measuring elements electrically isolated from the housing (as in a conventionalungrounded thermocouple). By adhering to standard good practice in grounding and shielding techniques, IRt/c’s can provide outstanding performance in the most severe electrical environments commonly found in production processes. Q. 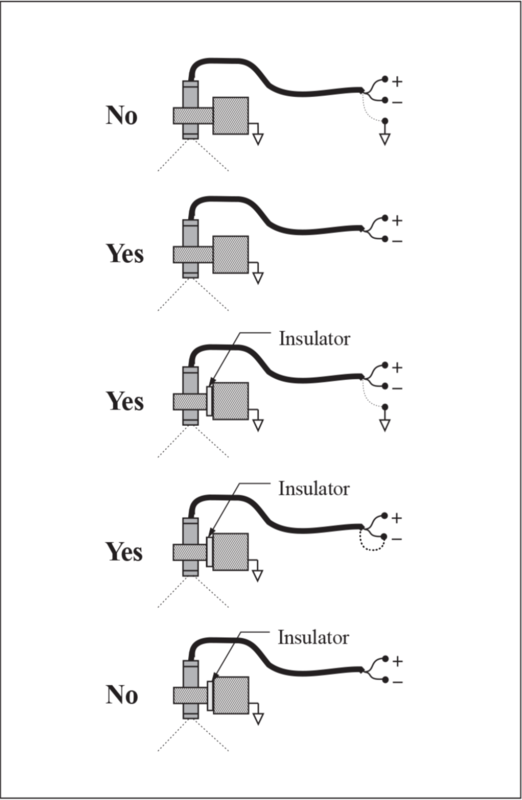 When is attention to grounding and shielding required? A. If the IRt/c must operate in extreme environments, employ long t/c cable runs, the measuring system is utilizing the high speed capability of the IRt/c,or if the process can generate high static electricity fields. For most installations, the built-in noise rejection characteristics of the IRt/c are sufficient to insure good performance, especially if the readout device is heavily filtered with a long input time constant. Q. Can I operate ungrounded? A. Yes, but it is not recommended, especially in applications where the process can generate high static electricity fields. Examples are web processes of all types, including printing, laminating, film drying, etc. Without either the housing or shield grounded to drain away the charge, a static charge can build in the housing, which may eventually discharge through the IRt/c sensing elements, and can cause damage to the sensor. Q. How do I use the shield correctly? A. The most important rule is to be sure the shield is grounded at only one point, preferably at the signal input ground. Keep in mind that the housing is connected to the cable shield, and if the housing is electrically in contact with machinery at the mounting point, that point will be a ground, and the shield wire should not be connected at the instrument end. For best possible performance, electrically isolate the IRt/c at the mounting point and ground the shield at a suitable ground on the readout instrument. Q. Can I ground the shield to the negative (red) thermocouple lead instead of to a chassis ground? A. Yes, but test both alternatives in your application and use the one that gives the cleanest signal. Be sure that the housing is electrically isolated, otherwise ground loop currents may cause errors. Q. Should the extension cable be shielded? A. As indicated above, if the installation requires high speed performance, twisted shielded extension cable and connectors with ground straps should be used throughout. Aluminum foil is a suitable material to complete a shield if their are gaps in the shield coverage.